These terms and conditions apply between ‘The 3rd Storey Cloud Ltd.', Registered in England, Company Registered Number 09994823 (including any subdomains unless expressly excluded by their own terms and conditions) which owns and trades under the names of ‘TEc Sketch’, ‘3rd Storey Technical Drawings’ and '3rd Storey Art and Graphics’ and you the user of this Website. ' The 3rd Storey Cloud Ltd.' are the owners and operators of this Website. Please read these terms and conditions carefully as they affect your legal rights. Your agreement to comply with and be bound by these terms and conditions is deemed to occur upon your first use of this Website. If you do not agree to be bound by these terms and conditions you should stop using this Website immediately. INTELLECTUAL PROPERTY AND ACCEPTABLE USE. 1. All content included on the Website, unless uploaded by users, is the property of 'The 3rd Storey Cloud Ltd.' and the Divisions of the company herein known as ‘TEc Sketch’, ‘3rd Storey Technical Drawings’ and ‘3rd Storey Art & Graphics’ and of our Registered Affiliates. In these terms and conditions, content means any text, graphics, images, audio, video, software, data compilations, page layout, underlying code and software and any other form of information capable of being stored in a computer that appears on or forms part of this Website, including any such content (or information) uploaded by Users. By continuing to use this Website you acknowledge that such Content is protected by Copyrights, Trademarks, Database Rights, and other Intellectual Property Rights. Nothing on this site shall be construed as granting, by implication, estoppel, or otherwise, any licence or right to use any trademark, logo or service mark displayed on this site without ‘The 3rd Storey Cloud Ltd.’ ‘TEc Sketch’, ‘3rd Storey Technical Drawings’, ‘3rd Storey Art & Graphics’, and or our Registered Affiliates without our prior written permissions. a) retrieve and view content on a computer. 3. You must not otherwise reproduce, modify, copy, distribute or use for commercial, business and or personal purposes any content, without written permissions of 'The 3rd Storey Cloud Ltd.', and or 'TEc Sketch', '3rd Storey Technical Drawings', '3rd Storey Art & Graphics' and or our Registered Affiliates. c) making, transmitting or storing electronic copies of the Content protected by Copyright, Trade Marks, Intellectual Rights, and Design Rights without permissions of the owners 'The 3rd Storey Cloud Ltd.', 'TEc Sketch', '3rd Storey Technical Drawings', '3rd Storey Art & Graphics' and or our Registered Affiliates. 5. This Website contains links to our other Websites, which are under the control of 'The 3rd Storey Cloud Ltd.', 'TEc Sketch', '3rd Storey Technical Drawings', ' 3rd Storey Art & Graphics' and or that of our Registered Affiliates. Please see the listing of our registered affiliates at the end of these terms and conditions. 7. The inclusion of a link to another site on the Website other than those under the Control of 'The 3rd Storey Cloud Ltd.' (please see introduction paragraph for the definitive companies) does not imply any endorsement of these sites themselves or of those in control of them. AVAILABILITY OF THE WEBSITES AND DISCLAIMERS. 9. Any online facilities, tools, services or information that 'The 3rd Storey Cloud Ltd.', 'TEc Sketch', '3rd Storey Technical Drawings', and '3rd Storey Art & Graphics' makes available through the Website's (the service) is provided "as is" and on an "as available" basis. We give no warranty that the Service will be free of defects and or faults. To the maximum extent permitted by law, we provide no warranties (express or implied) of fitness for a particular use and or for a particular purpose, accuracy of information, compatibility and satisfactory quality. 'The 3rd Storey Cloud Ltd.', 'TEc Sketch', '3rd Storey Technical Drawings', '3rd Storey Art & Graphics' and or our Registered Affiliates is under no obligation to update information on the Website. 10. Whilst 'The 3rd Storey Cloud Ltd.', 'TEc Sketch, '3rd Storey Technical Drawings' and '3rd Storey Art & Graphics' use all endeavours to ensure the Website is secure and free from errors, viruses and other malware, we give no warranty or guarantee in that regard and all Users take responsibility for their own security, that of their personal details and their computers. 11. 'The 3rd Storey Cloud Ltd.', 'TEc Sketch', '3rd Storey Technical Drawings' and '3rd Storey Art & Graphics' accepts no liability for any disruption or non-availability of the Website. 12. 'The 3rd Storey Cloud Ltd.', 'TEc Sketch', '3rd Storey Technical Drawings', '3rd Storey Art & Graphics' and or our Registered Affiliates reserves the right to alter, suspend or discontinue any part (or the whole of) the Website including, but not limited to, any products and or services available. The Terms and Condition shall continue to apply to any modified version of the Website unless is expressly stated otherwise. c) any special, indirect or consequential loss and/or damage. 16. You may not transfer any of your rights under the the terms and conditions to any other person. We may transfer our rights under these terms and conditions where we reasonably believe your rights will be affected. 17. These terms and conditions may be varied by us from time to time. Such revised terms will apply to the Website's, for the date of publication Users should check the terms and conditions regularly to ensure familiarity with the current version. 20. If any court or competent authority finds that any provision of these terms and conditions (or part of any provision) is invalid, illegal or unenforceable, that provision or part provision will, to the extent required, be deemed to be deleted, and the validity and enforceability of the other provisions of these terms and conditions will not be affected. 21. Unless, otherwise agreed, no delay, act or omission by a party exercising, any right or remedy will be deemed a waiver of that, or any other, right or remedy. When you fill in a form or provide details on any of our Websites - 'The 3rd Storey Cloud Ltd.', 'TEc Sketch', '3rd Storey Technical Drawings' and '3rd Storey Art & Graphics', we will never lease, distribute or sell your personal and or business details to any third parties, unless we have your express permissions or the Law requires us to do so, in either or both eventualities we will contact you directly for your permissions before any information would be released. a) We - 'The 3rd Storey Cloud Ltd.', 'TEc Sketch', '3rd Technical Drawings' and '3rd Storey Art & Graphics' will always hold your information securely. b) To prevent any unauthorized disclosure or access to your information to any third parties, we have implemented strong physical and electronic security safeguards. c) Any personal information we hold about you is stored and processed under our data policy and exceeds the requirements of the Data Protection Act 1998.
d) We also follow stringent procedures to ensure we work with all personal data in line with our high Policies and the Data Protection Act 1998. You may contact us at any time to discuss how we process and store any personal and or business information that you may give us on our sites. We - 'The 3rd Storey Cloud Ltd.', 'TEc Sketch', '3rd Technical Drawings' and '3rd Storey Art & Graphics' DO NOT collect or permit any third parties to collect or set cookie on any of our Websites. Should you see any pop ups on any of our websites we would be extremely grateful if you would ring us on any of our numbers and report this to us us immediately. All calls are free. We - 'The 3rd Storey Cloud Ltd.', 'TEc Sketch', '3rd Technical Drawings' and '3rd Storey Art & Graphics' will tailor make for each and every one of you, a package that will work with your administrative procedures and accounts departments to ensure a smooth and trouble free process with the terms of payment we have agreed. Please ring us at any time to obtain details. 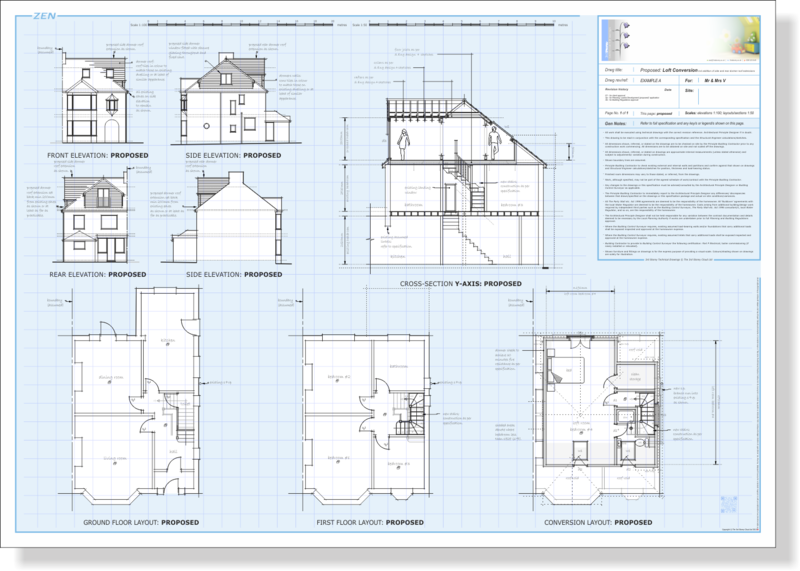 Examples of Technical Drawings for Loft Conversions. So You've Received One of Our Emails by Mistake? 3 Mistakes You Should Avoid When Deciding Which Builders Quote to Accept. Meet the Team behind 3rd Storey Technical Drawings. Why I Love Creating Technical Drawings for Loft Conversions. Question: What is 'The Elephant' in the Builder's Portacabin at the Moment?